SEATTLE — Aaron Horn, an information technology director for the Iowa Interstate Railroad, recently decided to take convenience in his home to the next level. Instead of running out to the store whenever he and his family needed Tide laundry soap, he installed a wireless button on the back of a cabinet door in his house in Swisher, Iowa. With one press of that button — called anAmazon Dash Button and made by the giant e-commerce company — Mr. Horn could reorder Tide anytime he needed, and the online retailer would ship him detergent. Now, Amazon is about to make ordering a box of Trojan condoms — as well as Slim Jims, Doritos and more than 100 other consumer products — as unchallenging as Mr. Horn getting that Tide. A year ago, Amazon, which is perpetually inventing new ways to buy things while using the fewest calories possible, introduced the Dash Button with a single purpose: to let customers order mundane products like garbage bags and toothpaste by pushing a button. 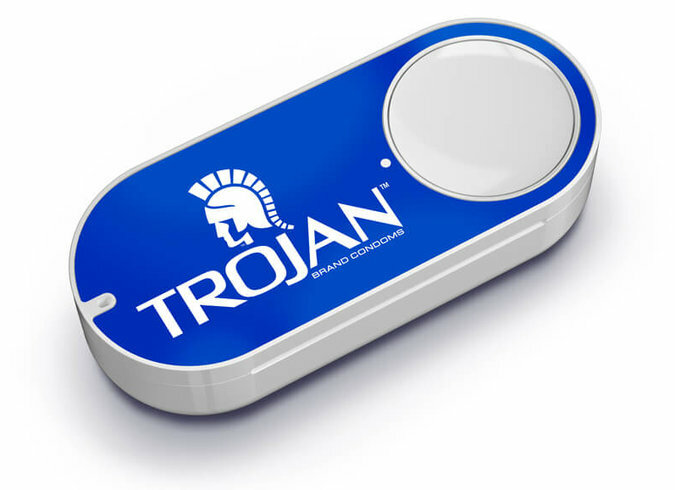 At first, many people thought the Dash Button — which is a plastic widget the size of a car key remote — was a joke, since Amazon introduced it just before April Fool’s Day. The idea behind a device that lets shoppers buy one thing, and one thing only, also seemed a little wacky. The Dash Button is no joke. On Thursday, Amazon said it was expanding the program from the nearly 30 brands whose products have been available for ordering through the devices to more than 100. Now, Energizer batteries, Stayfree feminine pads and Zico Premium Coconut Water will each have their own Dash Buttons. Peet’s Coffee, Red Bull beverages and Orville Redenbacher’s Gourmet Popping Corn are joining the club too, as is Arm & Hammer cat litter. Mr. Rausch said the use of Dash Buttons had been growing at a steady clip. The number of orders customers made with the devices jumped 75 percent during a week in mid-March compared with a week in mid-December, he said, without disclosing the underlying sales numbers. Dash Buttons are now pressed more than once a minute in total by Amazon customers, Mr. Rausch said. Amazon charges its customers $4.99 per Dash Button, but refunds that same amount after their first order using the device, almost guaranteeing that customers use it at least once. The device is available only to people who pay for Amazon’s $99-a-year Prime service, and items are delivered to customers with Prime’s two-day free shipping. Each Dash Button has a strip of adhesive for sticking it somewhere around the house, and a colorful logo for Tide, Orbit gum or whatever brand the button exists to serve. The widgets are effectively in-home advertisements for the brands, leading some analysts to believe that the brands are subsidizing the cost of the Dash Buttons bearing their names — something Amazon will not confirm. Amazon’s founder and chief executive, Jeffrey P. Bezos, has been on a mission to eradicate every conceivable obstacle to shopping online since the 1990s, when he patented Internet ordering with a single mouse click. With the Dash Button, Amazon is removing the headache of one-click ordering on a PC or smartphone — as questionable as that burden may seem — and putting the button on a pantry wall, countertop or medicine cabinet. Scott Galloway, a professor of marketing at New York University’s Stern School of Business, said Amazon would one day go even further by analyzing customer shopping patterns and proactively sending people replenishments of common household items. Amazon, based in Seattle, received a patent a few years ago for “anticipatory package shipping,” a method of speculatively sending goods to customers before they have actually ordered them. And the company is also helping makers of washing machines, pet food dispensers and other products design them so that the products themselves can automatically order replenishments on their own. To some, the Dash Button is another symptom of a creeping societal laziness, though Mr. Galloway says he sees the device as no more insidious than a television remote control. One obvious risk of making online shopping so easy is inadvertent ordering. By default, the Dash Button won’t allow a repeat order of a product until after an earlier order of the same item is delivered, a rule intended to prevent situations in which, say, a husband orders pet food right after his wife. But a child with a Dash Button can be a dangerous thing. Before Mr. Horn recently installed his Dash Button for Tide, one of his children got hold of it. “When our 6-year-old picked it up, my wife and I both yelled ‘Don’t push the button!’” Mr. Horn said. He was just in time: No unwanted shipment of Tide has shown up at his door.